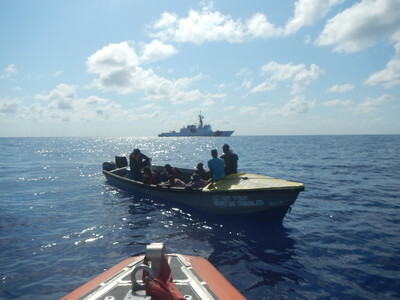 MIAMI — The Coast Guard Cutter Hamilton crew conducted its first-ever stop, interdiction, and seizure of a vessel trafficking marijuana March 22, while on patrol in the central Caribbean Sea. The quick response by the cutter’s law enforcement team led to the apprehension of six suspected smugglers and the seizure of nearly 2,000 pounds of marijuana worth over $3.5 million. As part of its Western Hemisphere strategy, the Coast Guard has increased its presence in the transit corridors of the Eastern Pacific Ocean and the Caribbean Sea. These routes are vital to the transnational criminal organizations that use them to move drugs to our borders and profit from the movement and sale of illicit goods. The cutter Hamilton is 418-foot national security cutter homeported in Charleston, South Carolina and is one of the vessels critical to defending and extending our borders far from land. The National Security Cutters are the largest and most technologically advanced ships in the Coast Guard’s fleet and are able to deploy for extended periods of time to support national objectives and enforce U.S. law far from our shores.